Simon Carter is a men’s designer fashion brand established in 1985. Based in London, the British fashion capital, the Simon Carter label thrives on inspiration gleaned from a vast array of sources, including the worlds of architecture, fine art, the decorative arts, and couture through the ages. The brand celebrates the quality and heritage to be found in the British Isles, using fine fabrics and old-fashioned labour-intensive processes to create its signature look. Products are always elegant and impeccably crafted, and frequently feature a note of surprise, subversion or humour – all designed to emphasise individuality and quality. The collection embraces accessories such as cufflinks, watches, fine luggage and jewellery, as well as shoes and a full clothing range. The discerning dresser will find everything he could possibly want, including suits, jackets, knitwear, and the Simon Carter signature shirts renowned for their bold colours, patterns and florals. 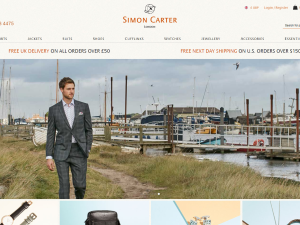 Simon Carter products can be found around the world in the best fashion stores, in the brand’s own shops in London and the south of England, and in the online store at simoncarter.net. Shop online, and all UK mainland orders benefit from free delivery and returns. Wherever you choose to shop, however, a Simon Carter product is a quality addition to the fashion collection of any intelligently conceived gentleman.